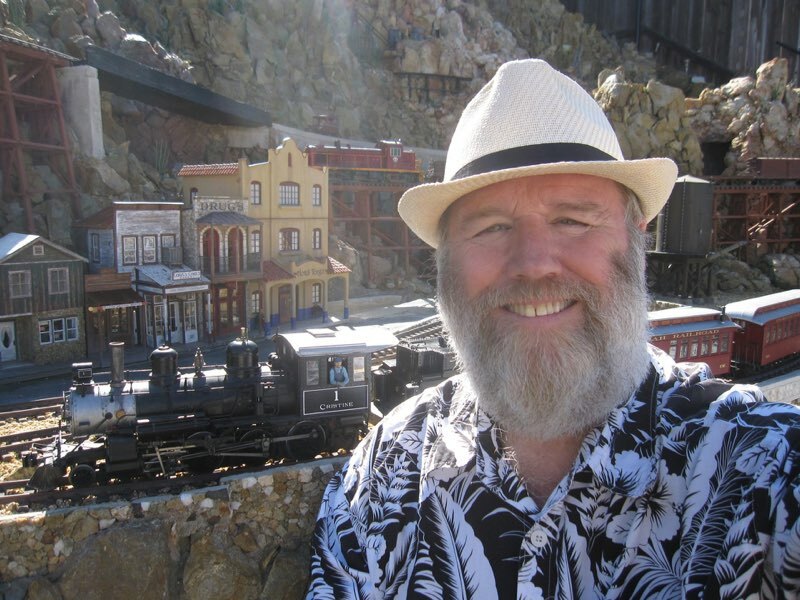 I had a visitor stop over to see the progress on the layout and talk On3 and Appalachia narrow gauge, Brian Bond of the Deer Creek and Laurel. While he was over I had him unload a coal train. 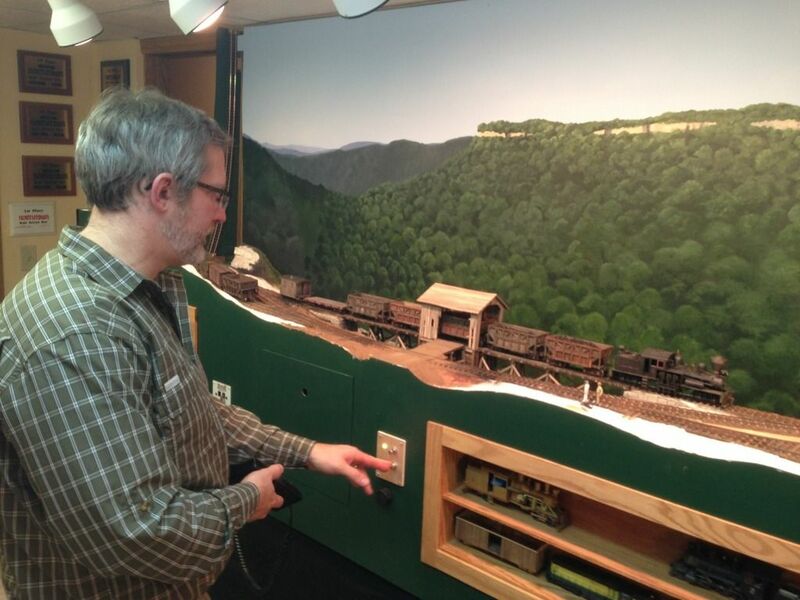 Where I like I have lots of model railroaders around but none that actually do the same stuff I do, so it is really fun to have Brian stop by. I like the way the scenery slopes down away from the viewer in this area. It's very different from the way most model RRs are laid out, and also allows the backdrop to blend seamlessly into the scene. For a split second I thought Professor Snodgrass had paid you a visit! Great visit! Thanks for having me over. The cars worked flawlessly for the visitor and as usual, I came away with some new techniques. Also came away with renewed inspiration, wheels on the Deer Creek were turning again yesterday after a long absence. WOW Jeff! Layout looks great. Yes, it's great to have visitors....but that can't be "Prof. Snodgrass" as he has only been seen "in uniform".... .
Now Brian, on the other hand is a "Virginia Gentleman" and has never been known to cast a nitpicker's eye or pontificate on the blatently obvious or tell stories like "well when I visited the rr back in '32 they didn't paint the switchstands that particular shade of black! 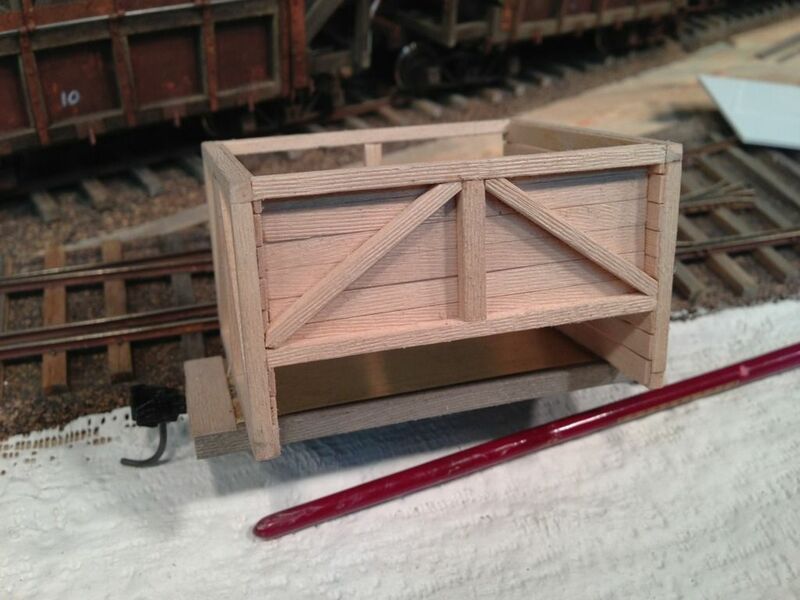 just finished two more hopper cars, now I have 15 finished. I have one more hopper body that is getting the details added and I decided to build one more from start to finish, which I am considering doing a build post on it. 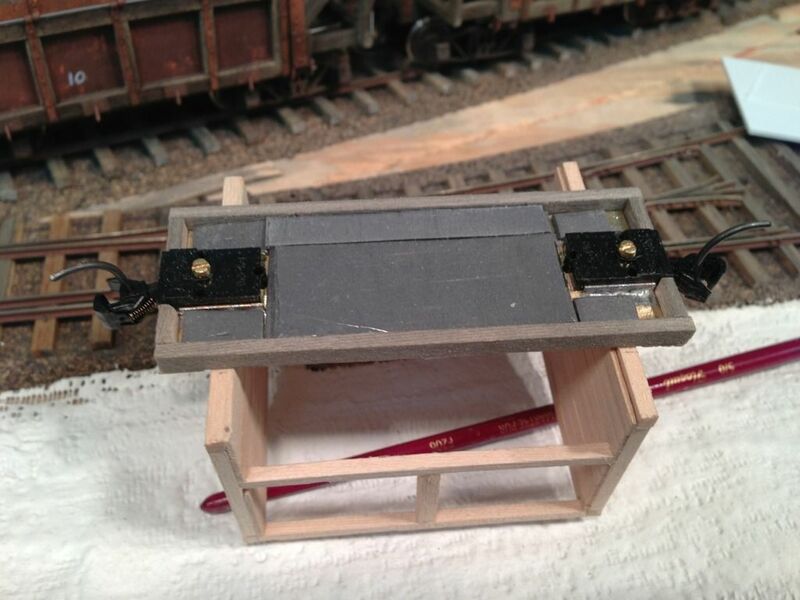 I hope to get back to the layout after I get these hopper cars done. 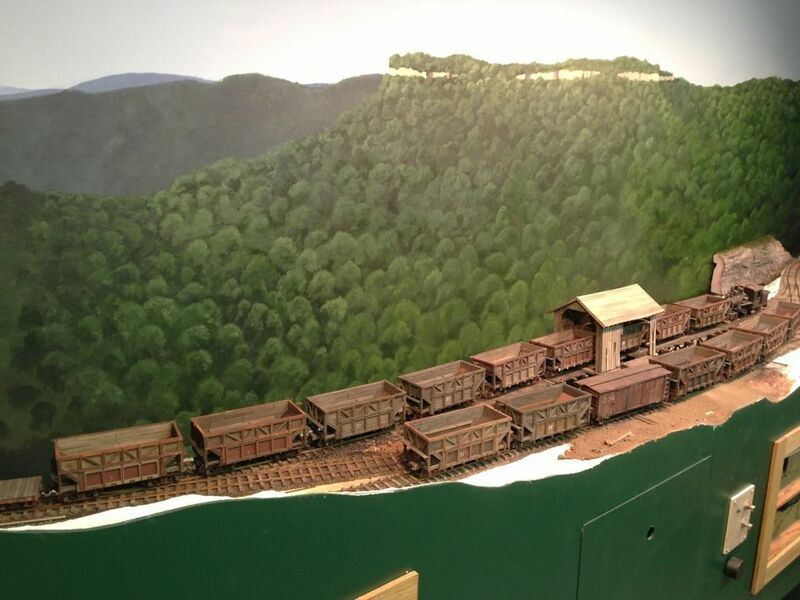 I did not what to stop building hopper cars because I was all set up and I got into a grove that I knew each step so well I could really get a lot done in a short time. I have been also toying around with the idea of building some of the Buck Jimmy hopper cars the MC operated early on and use them as rock cars for my slate train. I figure about five of the Buck Jimmy (4 wheel hoppers) is all I will need for slate service. A Buck Jimmy will be spotted at each mine (two at the large mine) for the loading of mine tailings. Every day the slate cars will be gathered and taken to a dump site, the MC just dumped then along the main line. 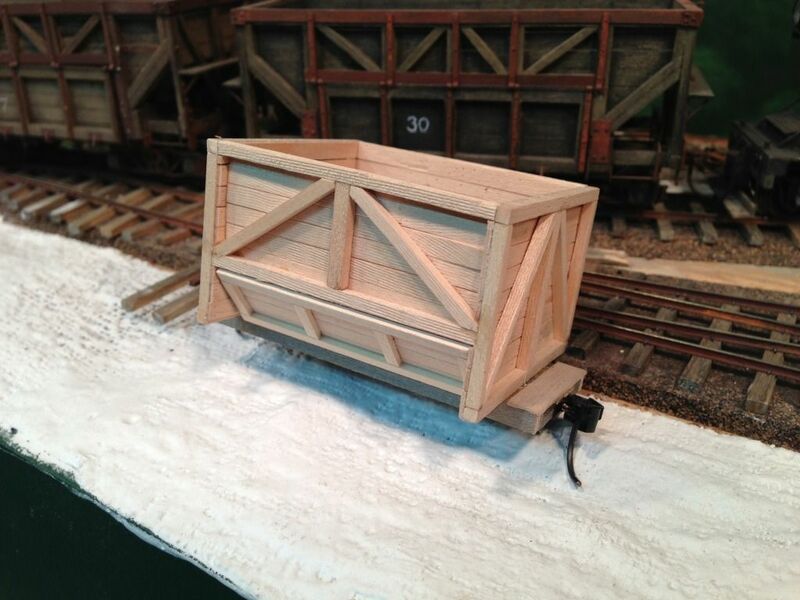 here are the 15 hopper cars on the layout. I started to build a prototype Buck Jimmy to see if there would be a way to make cutting and assembly jigs. I know that Boulder Valley makes a resin Buck Jimmy but I heard it was scaled down for On30, so rather than taking a chance I decided to build mine from wood. here is a photo of the car under construction. I built a subframe of 0.032" brass which I soldered brass and tapped some brass tubes for the Kadee coupler center post. The Kadee #803 coupler box was modified by cutting out the center post and shaving off the side and end post extensions. It is interesting that the #803 coupler box is the reverse of all the HO coupler boxes in that the coupler post is in the bottom of the box and not the top. Around the brass subframe I built up the wood car frame. I also added some lead sheet to bring the weight up on these cars. I will use Boulder Valley pedestals to mount a set of PSC wheels. Nice to see some of the faces of our members. Those hoppers all look great. I like how each one is colored (weathered) just a little bit different just like they would be on the prototype. Nice start on the Buck Jimmy's too. The hopper fleet looks fantastic on the tipple track. How do you consider the possibility of creating jigs as you build the prototype buck jimmy? What do you do different than you would if you were just building one car? For example, on the larger 20 ton cars I made five assembly jigs, five cutting jigs, and two locating jigs. The 20 ton cars assemble with two end frames in a jig, two body side frames in a jig, center slope sheet frames in a jig, and the door frames in a jig. Once all those panels are made I use a jig to assemble the cars to ensure they are square. At this point in the construction of the Buck Jimmy I am seeing a cutting and assembly jig for the end frames and the main frame. The sides of the Buck Jimmy are constructed a little different than the 20 ton cars because they share the same corner post as the end frames, so at this point I only see a jig to cut the frame members, which would help because there are some fancy angles to cut on the ends of the diagonal braces. At this point I would guess the doors can have a cutting and assembly jig. Great start to the Buck Jimmy. I look forward to the end result! 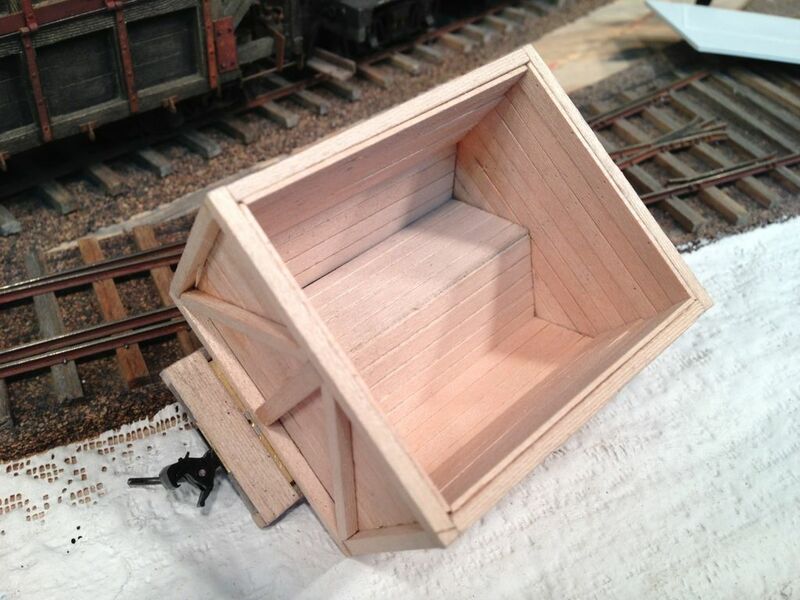 I am almost done with my last of the sixteen 20 ton hopper cars, after that I will build one more. I am waiting for some Grandt Line parts before I can finish. While I am waiting for the Grandt Line stuff I worked more on my Buck Jimmy...while I wait for the pedestal trucks from Boulder Valley. There sure is a lot of waiting for parts modeling in On3. The Buck Jimmy has a lot of places to hide weight and I filled all those places and I am surprised how heavy this little car is. here is the progress of the Buck Jimmy. The buck jimmy looks GREAT. I like you even put the nail holes on the inside (your sick man). I can't wait to see what they look like next to the new cars. If find it amazing they used these little cars up to the 1920's. Layout (and web site) looks great. Glad to see you back at it! Those look great. I'll take 6.